Astronomers say they've found a bizarre star system where two of the planetary orbits are 45 degrees out of whack, but do just fine. 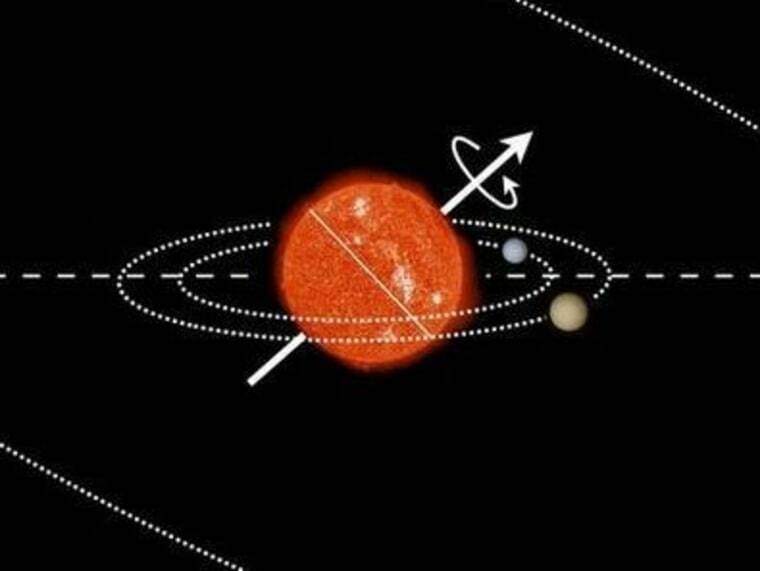 The secret to the planets' success appears to be the harmony of those misaligned orbits, plus the influence of a third object that's even bigger and farther away from the parent star. The strange case of Kepler-56 is reported in this week's issue of the journal Science. Kepler-56 is the name of the host star, one of 150,000 stars that have been monitored for several years by NASA's Kepler space telescope. Even though the Kepler probe itself is now out of service, scientists involved in the $600 million mission are continuing to pore over the data collected so far. Kepler can detect worlds in distant star systems by watching for the telltale dimming of light as planets pass over the disk of their parent stars. The probe can also study the structure of the star itself, using a technique known as asteroseismology. Kepler-56, which lies about 3,000 light-years from Earth, is more than four times as wide as our sun, and 30 percent more massive. The Kepler probe detected two planets wide enough to be considered gas giants, tracing orbits that lasted 10.5 and 21 Earth days. But the asteroseismic readings indicated that the sun's axis was tipped 45 degrees with respect to the plane of the planets' orbits. That's weird, considering that planets typically form from a disk of gas and dust that whirls in the same plane as the equator of their parent star. Sure, some planetary systems are oddballs: For example, the Beta Pictoris system appears to have a warped disk of debris, and Upsilon Andromedae has planets that are tipped 30 degrees with respect to each other. Planetary systems with close-in "hot Jupiters" are considered most likely to have tilted orbits. But there's no hot Jupiter in Kepler-56. The researchers behind the observations say they haven't seen a planetary system with these kinds of tilt-a-whirl worlds before. "It was a big surprise," lead author Daniel Huber of NASA's Ames Research Center told Nature. Huber and his colleagues turned to another planet detection technique, known as radial velocity, to fill out their picture of the Kepler-56 system. Observations by the 10-meter Keck Telescope in Hawaii revealed that there was a third companion object circling the star in a much wider orbit. The gravitational influence of that companion stabilizes the orbits of the closer-in planets, said Steve Kawaler, a physicist at Iowa State University and a leader of the Kepler Asteroseismic Investigation. "It issues a continuous tug on the orbit of the smaller ones, pulling them into their inclined orbits," Kawaler explained in an ISU news release. Another stabilizing factor has to do with the way the two smaller planets' orbits mesh. One planet takes almost exactly twice as long as the other one to complete an orbit. That harmony, known as a 1:2 resonance, keeps the two planets out of each other's way. In our own solar system, Pluto and Neptune have co-existed for so long because of a similarly harmonious resonance (2:3). Further observations should reveal whether the distant companion is a planet, a star, or a type of failed star known as a brown dwarf. If it's a planet, that would imply that the misalignment occurred after the two closer-in planets were formed. If it's a brown dwarf or a star, that would imply that Kepler-56's disk was warped before planet formation. “This is a new level of detail about the architecture of a planetary system outside our solar system," Kawaler said. "These studies allow us to draw a detailed picture of a distant system that provides a new and critical test of our understanding of how these very alien solar systems are structured." In addition to Huber and Kawaler, the authors of "Stellar Spin-Orbit Misalignment in a Multiplanet System" include Joshua Carter, Mauro Barbieri, Andrea Miglio, Katherine Deck, Daniel Fabrycky, Benjamin Montet, Lars Buchhave, William Chaplin, Saskia Hekker, Josefina Montalban, Roberto Sanchis-Ojeda, Sarbani Basu, Timothy Bedding, Tiago Campante, Jorgen Christensen-Dalsgaard, Yvonne Elsworth, Dennis Stello, Torben Arentoft, Eric Ford, Ronald Gilliland, Rasmus Handberg, Andrew Howard, Howard Isaacson, John Asher Johnson, Christopher Karoff, Hans Kjeldsen, David Latham, Mikkel Lund, Mia Lundkvist, Geoffrey Marcy, Travis Metcalfe, Victor Silva Aguirre and Joshua Winn.